A brainstorming sheet template can be downloaded here. The idea of brain‐storming is to enlarge the design space of possibilities. There should be a focus on quantity – to generate all the possible designs. This may, or may not, be a group activity. Brain‐storming on one’s own can be likewise rewarding. Also, software can be used to help in the process (such as the use use of mind‐map software can help users order their thoughts and ideas around a topic). But in this work we advocate sketching as the principle design tool. Generate Ideas. Sketch and draw as many ideas as you can think of. In reality these are mini‐ideas. They are short concepts that could be part of a whole. E.g. use a scatter plot, or line graph, or need some Dynamic query task to filter the results. These may be comprehensive and complete ideas, or half‐baked ideas, simple concepts or merely wacky suggestions. Filter the ideas. Take the ideas and start to remove any duplication. Remove any ideas that seem too similar to another idea. Categorize the sketches. Start to order and categorize the sketches, the mini‐ideas. Concepts that are similar should be located together. If you are using sticky‐notes then these can be easily moved and categorized on a wall, for instance. There may be different and alternative categorizations; just choose one and move on. The categorization and the ideas will probably change and develop anyhow. Combine & Refine. Start to organize the mini‐ideas into bigger solutions. Perhaps have multiple views: this could be two visualizations that demonstrate different aspects of the same information. Question. The final stage is to question what has been generated. Does this provide a solution that the client wants? Does it answer the original research questions? This process can be run as a group activity. It is important to consider that participants must not initially criticize or evaluate the worth of particular designs. 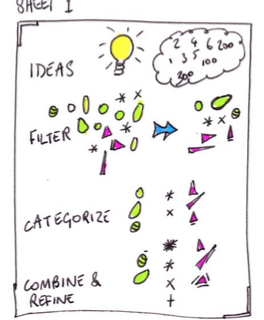 Keep the ideas flowing by getting participants to sketch their individual ideas down on their own sheets of paper (sticky notes are useful in this exercise). Invite and record any ideas that they participants create. Try to make sure that the whole design space of possible designs is covered. Unusual or wacky ideas should be tabled.